Hillel campers were excited to get an autograph from Mets outfielder Brandon Nimmo. 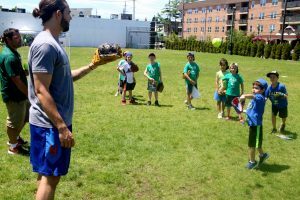 Mets players Brandon Nimmo and Robert Gsellman paid a visit to the campers at Hillel Day Camp on Friday, July 20. The players spoke about their experiences in Major League Baseball. Campers also had the opportunity to practice their baseball skills while being coached by the players when catching and throwing the balls. Let’s go, Mets! Mets pitcher Robert Gsellman playing catch with Hillel campers.